Our morning game drive was one-of-a-kind at Chief’s Camp and the Moremi Game Reserve National Park in the middle of the Okavango Delta. We left for our game drive at 7 a.m. after getting up at 5:30 a.m., and having breakfast at 6:30 a.m. It was just perfect weather and a tad cool which is the way you want it. 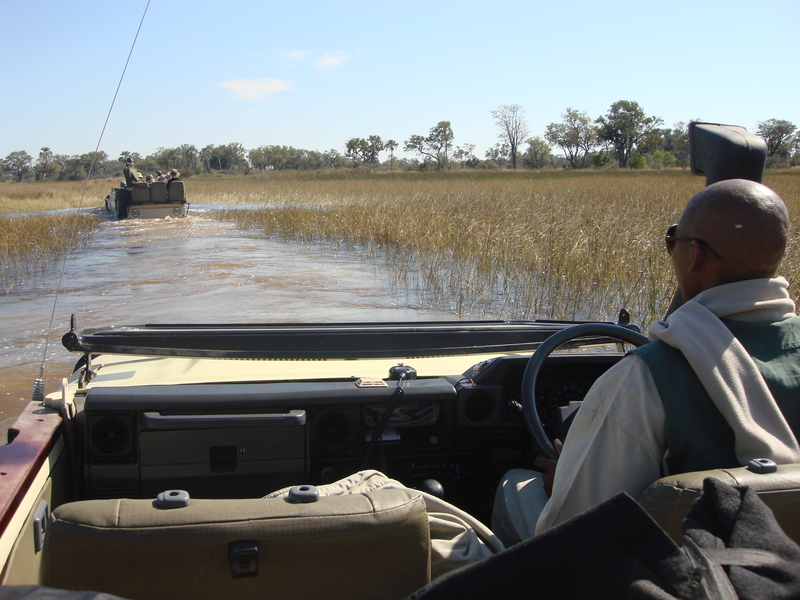 After we “went swimming” crossing the Okavango Delta, we drove and we drove and didn’t see any of the big game. It was our last game drive in the Delta because we were going to Chobe National Park in the northern corner of Botswana by the river area that drains into the Zambezi River. Our driver, Ali, was kind of an aggressive safari driver/guide. He would stop periodically and instantly to look at animal tracks on the ground and he could tell if it was a lion, leopard, elephant, hyena, etc. He also would suddenly stop and listen to the animals, particularly the impala, because they snort real loud when a predator is near. So this is how the drivers know where and how to spot the animals. It is like hunting a needle in a haystack. It is the thrill of the hunt that makes a safari, and this morning was a true 100% thrilling one of a kind safari ride! Again, Ali suddenly stopped and leaned out of the vehicle to look at tracks on the ground and said “Lions, that way.” And he made a U-turn and was driving down this trail and he said “here they are.” And none of us saw them. He said, “See they are right here and they were about 10 feet from our van and lying down in the cream-colored grass for an early morning nap”. Then they jumped up and stared at us for a while and then they napped again. 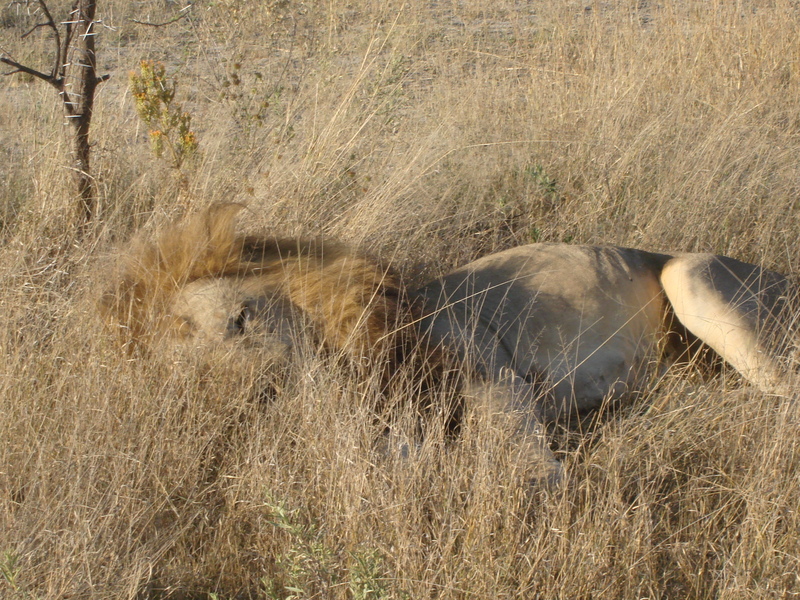 It must have been a rough night as lions hunt mostly at night. Ali told us the lions were about 7-8years old and they were the dominate males in the area, known as the “Bocca Boys” after the river they had to cross to get there. They had dark brown full manes and were so beautiful. We remarked how such a dangerous animal could be so beautiful. We were about 10 ft. away from them. It just took our breath away because this was not the zoo. These were 2 wild killer animals and we were sitting there 10 ft. away, priceless! Then Ali got a call on the radio while he was driving from a driver and they tell each other what they have spotted or that they need help. And they always speak in their language so we will not know what they are saying. The radio came on and it was our tour guide KB who was driving the other safari van. KB said they have spotted a leopard! 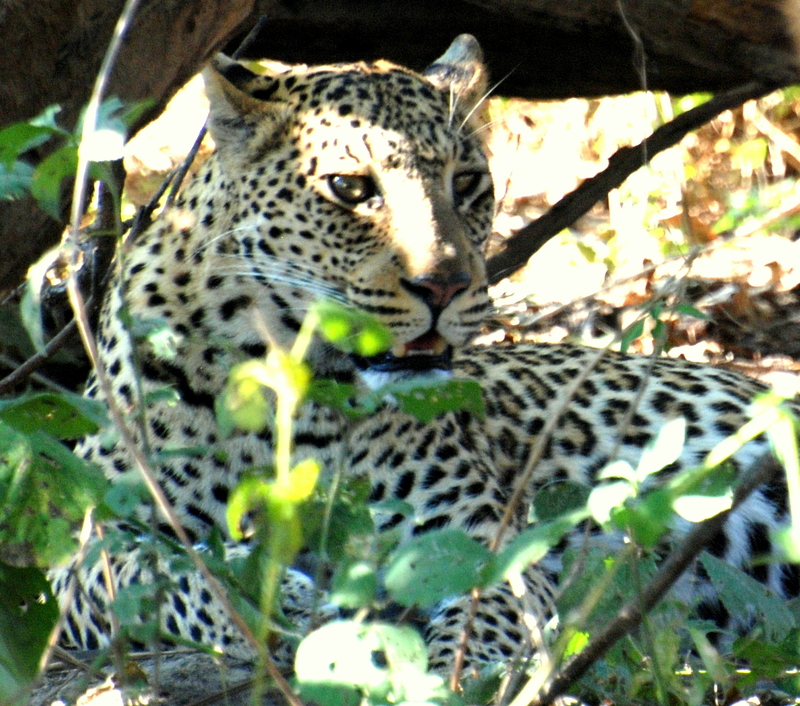 Leopards are very rare and very hard to fine. They are like a needle in a haystack. 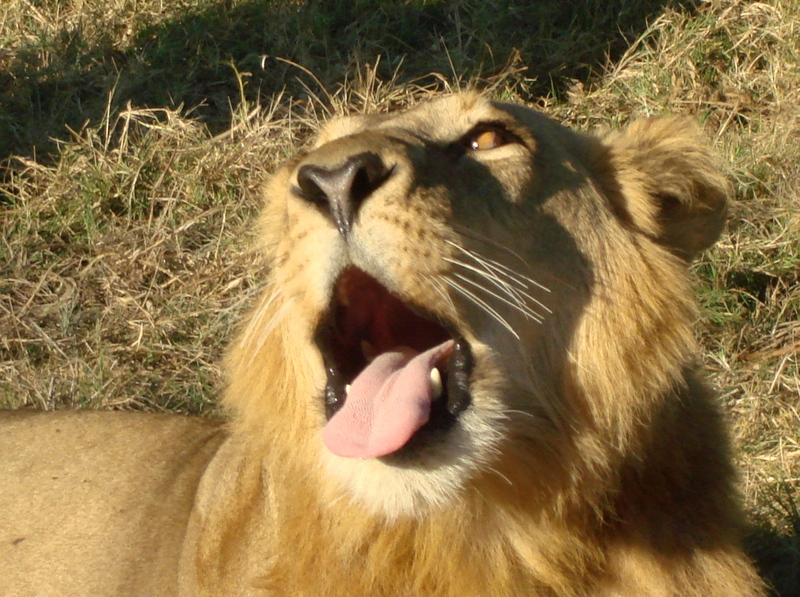 Now our decision was-do we stay and watch 2 precious beautiful young male lions or to leave and go see the leopard. 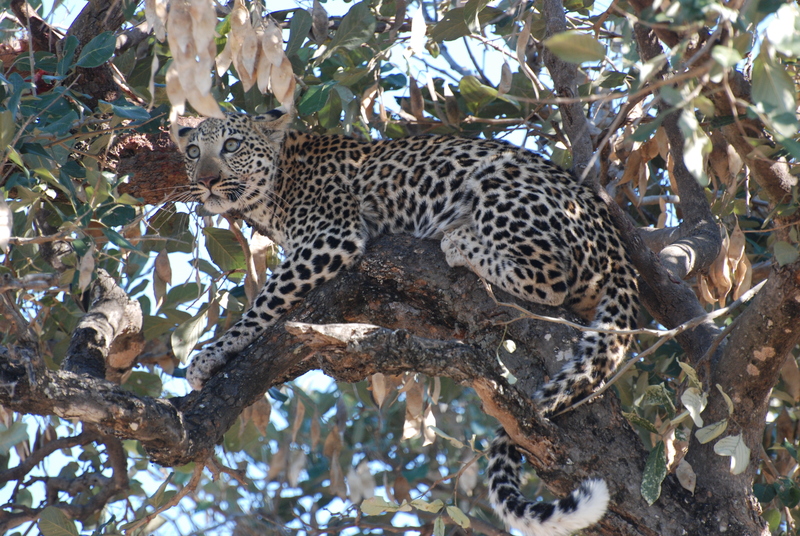 Ali makes the decision to go see the leopard as it would be a “great finale” for our final Okavango Delta safari. Previously on all safaris, including this one, it was no big thing to leave what you were doing and seeing and go to where an animal has been spotted. But what we didn’t know was that this would be no simple thing. Ali drove that safari van “like a bat out of hell.” We were all holding on for dear life. Ali moved Chris to the front seat from the back seat because she would be thrown out of the van. We soon learned what he was talking about. In all my 6 safaris I have never had such a ride. Even getting to and from Antarctica was not that bad. Ali took us through anything and everything like the US Marines and Team 6. And we did it at a high rate of speed. I am guessing we went an average of 30 mph. Now, that might not seem like a high rate. But we went over 10 inch logs on the ground, downed small trees, through holes in the ground and water ponds, acacia trees covered with thorns, tree limbs that would hit us in the face, bumps that would just about throw us from the van and we were in the center–that is a high rate of speed!. We would come upon a roadblock of trees, brush, and stumps with no possible way of getting through it and we went right through it! Tree branches hit us and thorns cut us and right-left instant moves whipped us from side to side and crossing a 10 inch log would jolt us to the ground. 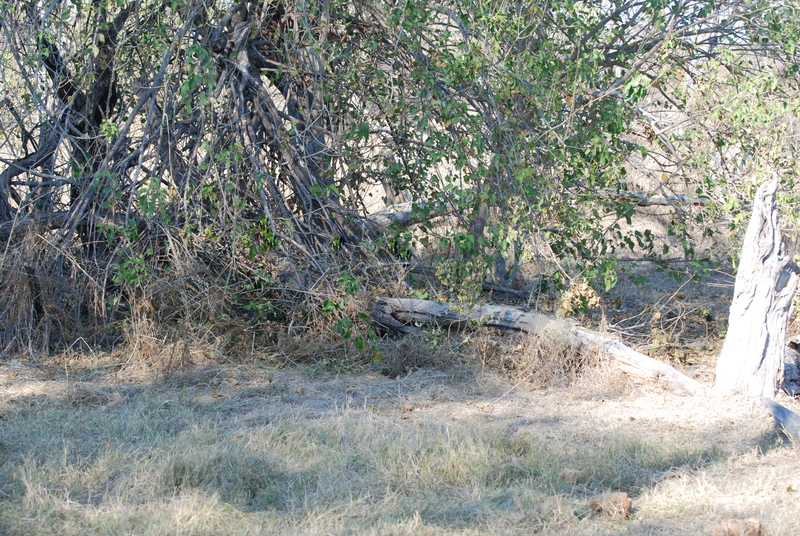 But we had to see that leopard! Now, another thing I didn’t tell you was that usually it takes less than 5 minutes to catch up with another van that has spotted an animal. But, not this time. 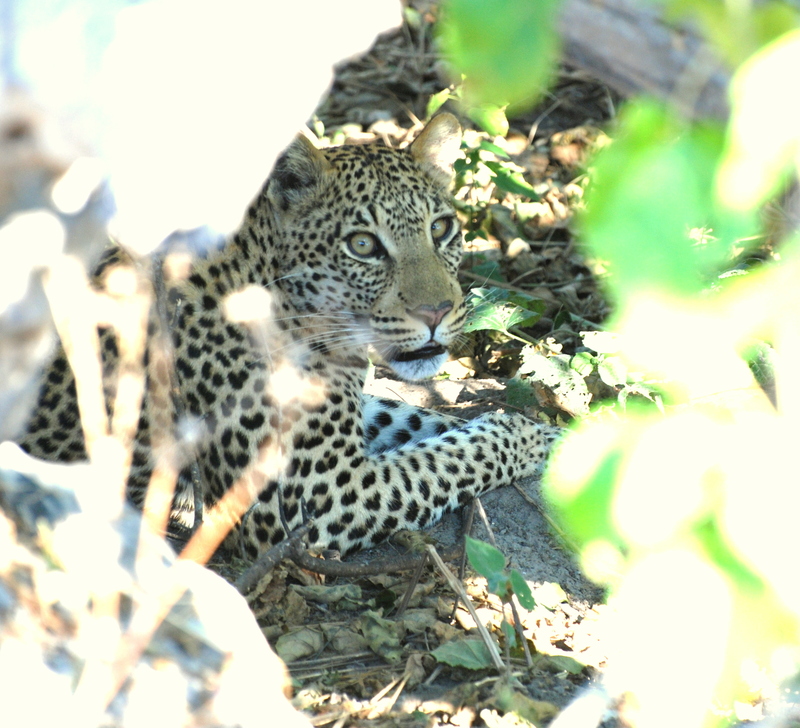 It took 40 minutes of this rough riding to finally find that leopard and it took me a while to appreciate that beautiful cat because I was just totally exhausted-as were the other 4 in the van. And I wondered if it was worth all of that just to see a leopard. And we all wondered how many back surgeries we would have to have. I asked Ali if we were going to the top of Africa it took so long. I thought the ride would never end. We were crossing the Moremi Game Reserve we learned later. It sure is a big park. But then, we finally located KB and the other vans. They were in constant radio communication so they could lead Ali right to it. Each driver describes and knows all areas and they don’t need GPS. How they find their way around is beyond us. 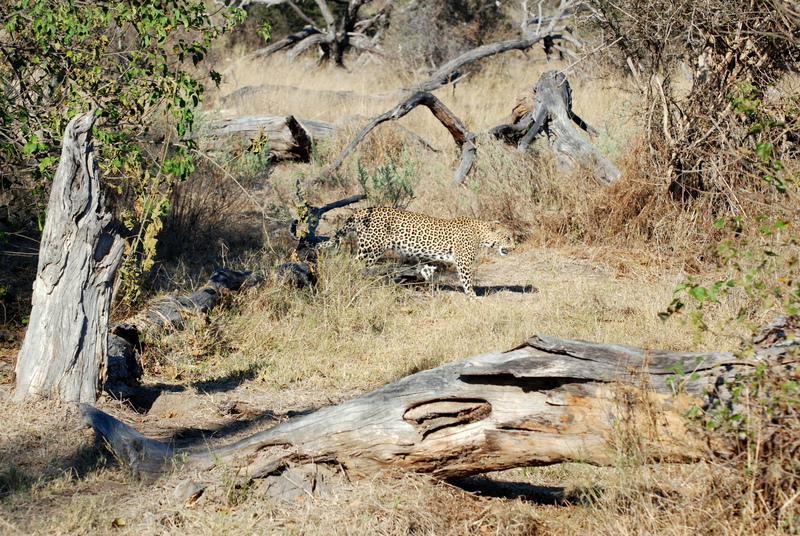 The female leopard was walking constantly so we had to keep up with her and the wild driving continued. She was so beautiful and a gorgeous specimen. When she would pause for a short rest, the cameras would click like machine guns. And we tracked her to 10 different sites and positions. Ali would move us around the cat to get the best view and camera shot. And we got some good ones. Then Ali said, “I’ve got even a better leopard to show you.”So off we went on another wild ride through the bush. And again it was worth it. 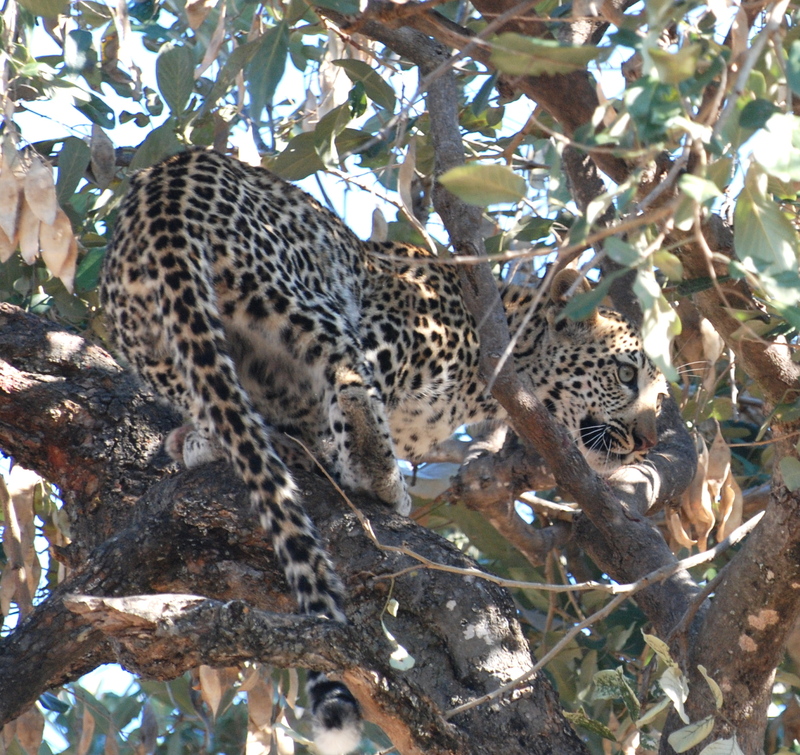 There in the tree was an absolutely gorgeous leopard with her breakfast, an impala. We really got some fabulous photos of the leopard because Ali kept moving us around until we did. He really earned his tip that day!!! It was a fabulous end to our safari in the Okavango Delta. We saw two gorgeous male dominate full-mane well-fed lions and 2 leopards with absolutely fabulous skins and furs and they were both well fed. Now, we had to get to our plane, but we all had to use the restroom after that ride so the plane would just have to wait. 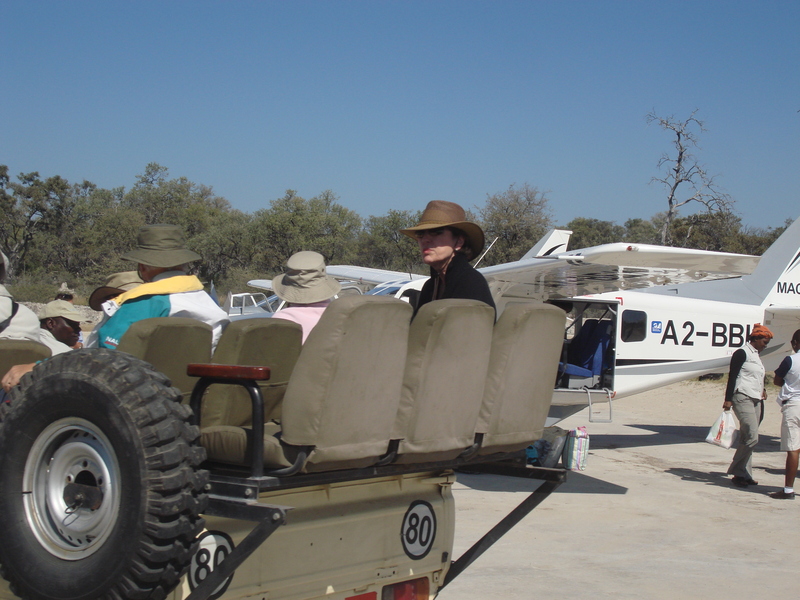 So out in the middle of the Okavango Delta where wild animals live, we all went to the restroom and made it safely back to the safari vehicle. We were supposed to leave on the plane at 10:15 am. Only we were far away from the runway looking at leopards and lions. So again, Ali drives “like a bat out of hell” to get us to our airplane. Through water, brush, trees, stumps, 10 inch limbs, you name it we went over and through it and made it to the runway by 10:16 am. And the two planes were waiting for us and all went well. 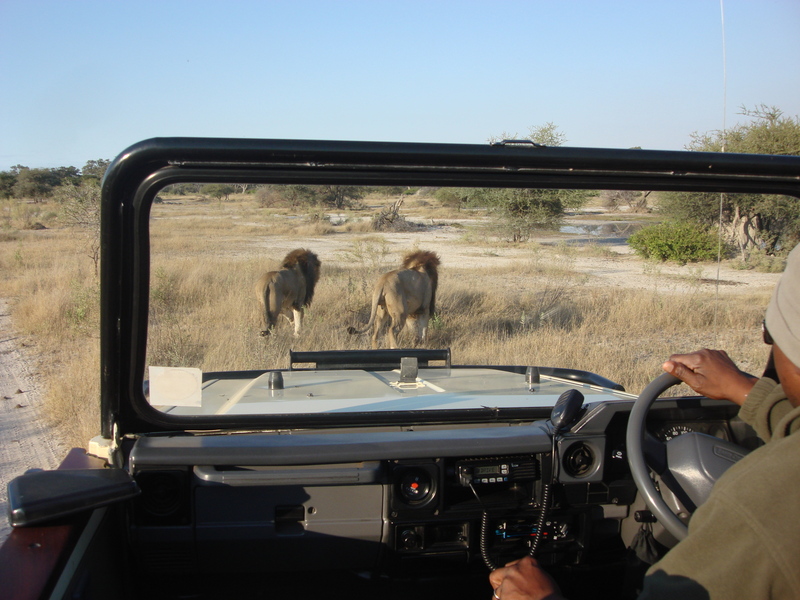 So now you get a good idea what it is like to be on a one-of-a-kind safari run in the Okavango Delta. When a big cat or elephant or something in the killer animal category is spotted, all hell breaks out to get the visitor to see it close. And it was worth every effort and every minute. We thanked Ali and thanked Ali and thanked Ali for making our Okavango Delta experience a “beyond awesome” dream. It was priceless!